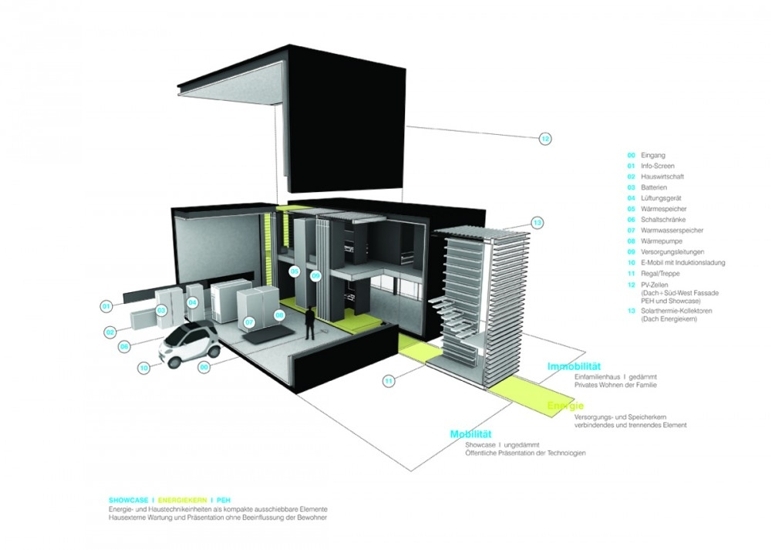 The Institute for Lightweight Structures and Conceptual Design (ILEK) at the University of Stuttgart just unveiled a concept home that is not just net zero — it’s actually designed to generate excess energy to charge electric cars within its futuristic carport. Similar to many of the homes in the solar decathlon, this home is packed to the gills with integrated green technologies and fed by huge rooftop solar electric and thermal arrays. The home has an open face to the street side that showcases its systems with a interactive display — it’s essentially a show room of integrated sustainable design and transportation for the future, and it’s set to be built in Berlin by the German government. Now you can have a house to go with your new Nissan Leaf or Chevy Volt. The concept home aims to generate enough energy for shelter and transportation. The Plus-Energy House with Electromobility‘s design is a response to the issue of matching solar power produced and power consumed. The super efficient home features smart controls that divert energy to electric vehicles in the garage or send it back into the grid to feed other local buildings. A large open front of the home displays the concept prominently, with a large space dedicated for transportation. Tucked behind the carport is a transition space with displays and a two-story living space. The home’s design feels a bit like one of those floor models that they cut in half so you can see the guts. Another intriguing aspect to the home is how ILEK, headed by Werner Sobek, has been able to apply their insights into an efficient, highly-developed lightweight construction design that is a snap to set up and then deconstruct. The home has no permanent foundation, so can be placed in many locations with minimal disturbance, and disassembled again to form raw materials for a new building. @yrag01, indeed all new technology are expensive. But it doesn't mean that the cost of it will not reduce gradually. This is a prototype. Every new invention started off expensive before becoming affordable. Take example CDs, plasma TVs and laptops. I'm sure that, given time, this will become affordable as well. "this home is packed to the gills with integrated green technologies and fed by huge rooftop solar electric and thermal arrays" Great! And how much does all that cost? It does no good if no one can afford it. Beautiful design! Brilliant. My question is about the energy efficiency of glass. If glass is far less insulative than a wall can be; why are there so many (way more than normal homes) windows? It seems like this house could be MUCH more energy efficient with less window and more insulation. Is this just for aesthetics or is there something I don't know. 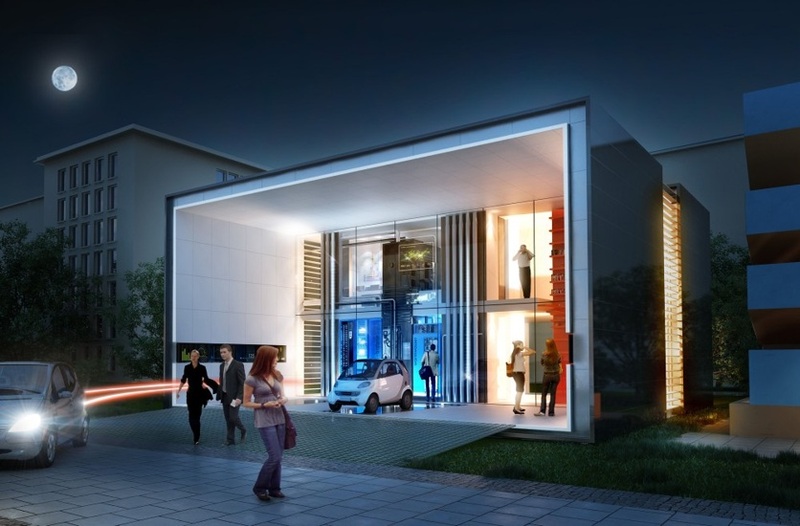 The Institute for Lightweight Structures and Conceptual Design (ILEK) at the University of Stuttgart just unveiled a concept home that is not just net zero -- it's actually designed to generate excess energy to charge electric cars within its futuristic carport. Similar to many of the homes in the solar decathlon, this home is packed to the gills with integrated green technologies and fed by huge rooftop solar electric and thermal arrays. The home has an open face to the street side that showcases its systems with a interactive display — it's essentially a show room of integrated sustainable design and transportation for the future, and it's set to be built in Berlin by the German government. Now you can have a house to go with your new Nissan Leaf or Chevy Volt.